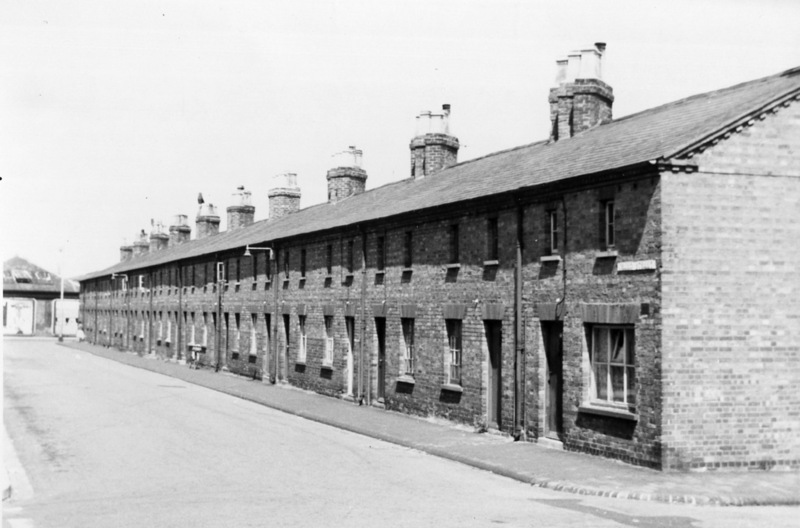 This row of twenty terraced cottages, taken from the Church Street corner, was the first of the new section of Wolverton started in 1840. They faced the school and later the Church Institute and the area is now filled by a parking lot. As with many of the other cottages of the period they had two rooms downstairs and two up, and (hard to believe , I know) were considered superior to the first tranche of cottages built in 1838 at the northern end. This little sketch shows how the buildings at the south end of Creed Street may have looked in the 1840s. By the 1940s there was not much evidence of any of this and most had ceased business by 1900. The bakery was probably the premier baker in Wolverton in the 19th century but as the town developed to the west it was superseded by the new bakery on the corner of Radcliffe Street and Church Street and later the Co-op bakery on the Market Square. The double unit at the far end was a Co-op grocery, one side being used as a shop and the other as a residence. People of my generation will remember this as Billingham’s Fish and Chip shop, open evenings and Saturdays. The Co-op moved along to Church Street in the 1890s and a former manager ran the grocery as an independent.